Do not hire to Sr. to early once you have raised capital / have access to capital. Co-founders are always excited to hire a sr. sales role after they have access to capital. This makes sense because sales are the one thing that are out of your control (vs. areas that you can deploy capital: marketing, product, tech, etc.) and are hard – other people that you do not pay have to make a decision to invest their money and time with your product. The thought process is simple, if we just find someone who has “done it before” they will make magic happen. The reality is that the actual magic is founders who know their product well and deeply believe that their product will improve the lives of customers. The more you unpack the “changes” the more visibility you have and you have a higher chance of getting to your goal(s). Now if you choose to, you can unpack each one of them to get to your goals. The more depth you go into, the more that you can focus on a plan to make sure that you are going to achieve your goals and course correct if you are not heading in the right direction. Now that we have a basic understanding as to the broad buckets, how do we back into what we have to be doing to achieve the goals? Let’s take the New To-Be Identified Customers (future customers that do not currently exist on the pipeline). In the sales bridge, we see a goal of $1M. If our product is $100,000 per license per year, then we are going to need to close 10 new customers. To close 10 new customers, we know that we need to be talking to 100 customers by the end of August (since there is a four month sales to close cycle). To talk to 100 customers, marketing needs to generate 1,000 leads and our current website is only generating 50 leads per month (8 months x 50 leads per month = 350 leads). So how do we find the additional leads that we need? That is how you unpack a number and start to thinking about every aspect of your business. This work backwards concept makes you pay attention to the details. By this stage you likely see where this is going and how all KPI’s for different groups can be backed into by running an exercise of just asking a simple set of questions around your revenue projection. The fun part of this is to start tracking progress against it, where you add in a new variable: business booked. Then start hiring. Once your process are in place and you understand your goals, start hiring. But don’t hire Sr., higher Jr. Let them see how you handle sales meetings, build out all of the materials that are needed, build the reporting infrastructure out so everything can be tracked, when you add to the team, your sales ops function can now help to get everyone organized. After this exercise, I promise you additional clarity and now your 3x goal feels manageable and with frequent review and updating you will have visibility into over or under performance which will be critical to managing your capital and your key stakeholders. 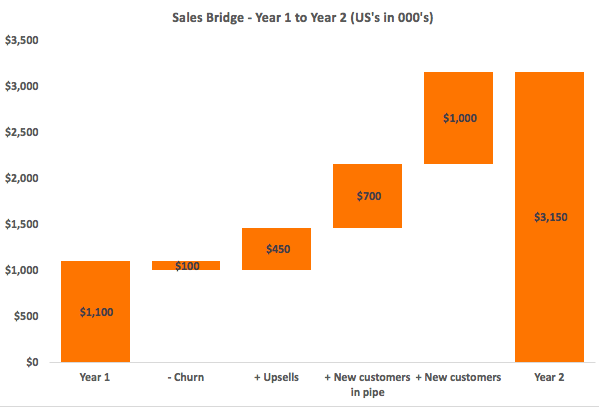 Several people have asked me – so here is a sales bridge template used for file above. Please rethink all formulas, as each build requires a different set of formulas. Thanks, Zach – this is awesome. So many articles focus on hiring your first VP Sales or taking some other massive leap once you have like twelve dollars coming in….. I’ve been missing this “middle step” on how to actually BUILD sales. Glad to see that it’s pretty straightforward stuff. Thanks again, and please keep sharing your know-how with the rest of us!